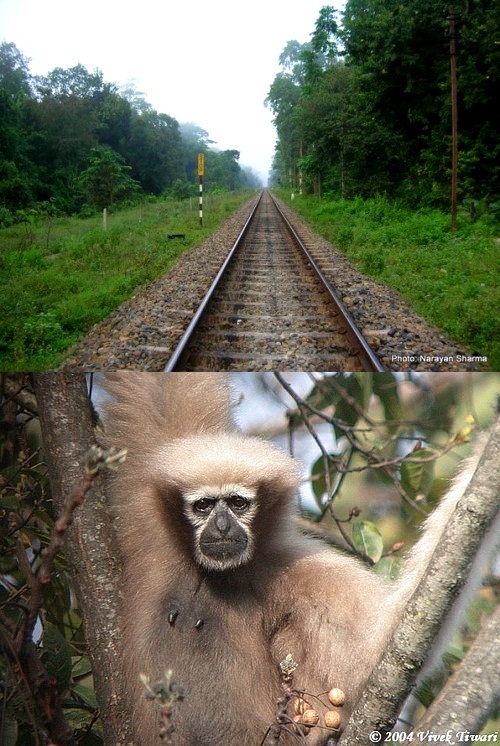 Hollongapar Gibbon Wildlife Sanctuary - known for its flagship resident and India’s only ape — 'the Hoollock Gibbon' is situated in Jorhat district in Assam with semi-evergreen forests and evergreen patches amidst tea gardens and human settlements. The sanctuary has derived its name from the Hoolock Gibbons, an endangered species of primates, found only in India. Gibbon Wildlife Sanctuary is popularly known for its staggering primate community and it is one of the highest primate density areas in the world. The sanctuary covers an area of 20.98 sq. km. At the time of British rule and till 1996, the sanctuary was known as Hoollongapar Forest. The Forest had been named after the species of trees - Holong and Agar. The Government of Assam has notified it as Wildlife Sanctuary on 30th of July 1997 and since then it came to be known as Gibbon Wildlife Sanctuary. The sanctuary is dominated by trees like Ou Tenga (Dillenia indicia),Amari (Aglaia spectabilis), Gahorisopa (Magnolia griffithii), Borhamthuri ((Magnoliaceae hodgsonii), Bandardima (Dysoxylum sp. ), Titachapa (Michelia baillonii), Bhelekor (Aristolochia tagala) etc. The primate community of Gibon Wildlife Sanctuary consists of four species of macaques, one species each of langur, gibbon and loris. Some of the animals found in the forest are Western Hoolock Gibbon, Elephant, Leopard, Tiger, Pangolin, Assamese macaque, Pig tailed macaque, Rhesus macaque, Stump tailed macaque, Capped langur, Slow loris, Jungle cat, Indian civet, Giant squirrel, Barking deer, Sambar, Wild pig and Squirrels. There are more than 200 varieties of Birds found in the area. Indian Pied Horn Bill, Osprey, Hill Myna, Kalij pheasant etc. can also be seen. Recently, on January 09, 2009, White-winged wood duck, a rare and engendered bird was sighted in the sanctuary. The sanctuary is 5 kms away from Mariani Rly. Junction and 25 kms from Rowriah Airport (Jorhat). It is about 19 kms from Jorhat town.